Our website provides interesting articles and helpful ideas on pursuing your personal research. We update the website frequently, so please check back often. If you have any comments or suggestions you'd like to pass along, please feel free to send us an email. Click on the "Contacts" tab for the proper person to address. The Farmington Genealogical Society meets on the third Tuesday of each month, September through May except December at the Downtown Branch of the Farmington Library, located at 23500 Liberty Street in Farmington, Michigan. We begin our meetings at 6:30 pm with discussion of our research -- both good and bad, giving each other encouragement as well as solutions. Our speaker presentation begins at 7:00 pm. The Library is 1 block west of Farmington Road and 1 block south of Grand River. Parking is available at the library and behind the businesses that face the west side of Farmington Road, as well as a parking lot just south of the library, behind the CVS store. Click this link to Google Map. This year we celebrate the 45th Anniversary of the founding of our Society! 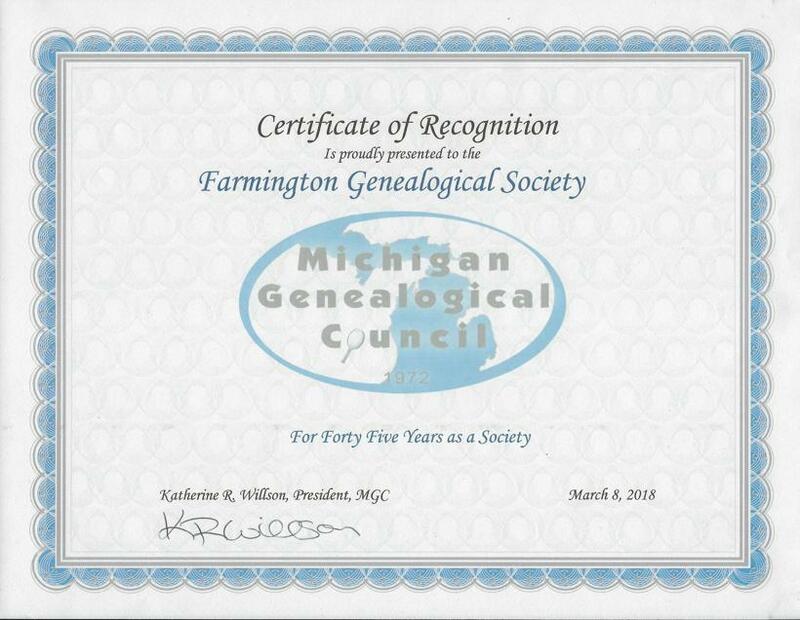 We are so honored to receive this Certificate of Recognition from the Michigan Genealogical Council. We have a rich heritage to preserve and thank everyone who contributes to make our Society successful! Happy 45th Anniversary! We’re underway! Let’s index some records! The Archives of Michigan is thrilled to announce the launch of a digitization and indexing project to make naturalization records from nearly 70 Michigan counties freely available online. In a partnership with FamilySearch, and with the support of the Michigan Genealogical Council, the Archives of Michigan will enlist the help of volunteers like you to transcribe key genealogical information from the records. Once completed, the collection – including both the images and index – will be freely available only at Seeking Michigan (http://seekingmichigan.org). One of the most valuable record sets available to family historians, naturalization records document the process of immigrants becoming United States citizens. They potentially can provide a wealth of information for genealogists, including the immigrant’s birth information (including the village of origin), marriage date and location, spousal and children’s birth information, the date and port of arrival in the United States, and even the name of the ship, vessel, or railroad line. This collection of Michigan naturalization records includes hundreds of thousands of records from across the state, ranging in some cases from the 1830’s to the 1980’s. Interested volunteers can easily work from home using FamilySearch indexing software to transcribe information from the records to make them searchable. Users can download the indexing software, register as a FamilySearch user, and then start indexing records all within a few minutes. Click on the Indexing tab at the FamilySearch home page to get started: https://familysearch.org. This project’s timetable largely depends on all of us in the genealogical community and how quickly we can index the available records. Indexing is about 25% complete! So let’s get keep going! Additional information about this exciting project, as well as instructional material for using the indexing software, can be found at the Naturalization page at Seeking Michigan (http://seekingmichigan.org/naturalization). Thank you for being such an integral part of this massive and important project! If you shop with Amazon, please consider using the Amazon Smile donation program. Amazon will donate a portion of their take on the transaction to our society. The index of Thayer-Rock Funeral Home Records is now ready for examination. Selected information from the records of Farmington’s Thayer-Rock Funeral Home for the period July, 1937 - December, 2017, have been made available for review. More books will be added as they are indexed. There are instructions to order a copy of those you are interested in when you click on the “Thayer-Rock" button on the left. Images of Michigan death certificates from 1921-1942 are now available for free at Seeking Michigan: http://seekingmichigan.org/ The index for records from 1943-1952 are also available, with additional certificate images to be released each year as privacy restrictions are lifted. Together with the records from 1897-1920 that have been available at the site for years, this collection makes Seeking Michigan the one-stop destination for more than 2.6 million free, publicly-available 20th century death records for Michigan ancestors. This 1921-1952 collection of death certificates and indexes, in partnership with the Michigan Department of Community Health and FamilySearch, covers a critical period in the growth and development of Michigan. Here, researchers will find evidence of the influx of Eastern European immigration, the emergence of Detroit as the automotive capital of the world, and a state crippled by the Great Depression. Those ancestors that immigrated to Michigan, worked the assembly line, and sturggled to make ends meet can all be found here. An individual's last name, first name, county and township/village/city of death, birth year, age, and parents' names are all indexed and searchable. Additional information, including the decedent's occupation, cause of death, burial location, and birthplace is listed on the certificate itself. Michigan death records from 1897-1952 are now all in one place, for free! The Archives of Michigan received well over 1 million index cards from The Detroit News at the end of 2014. These cards have been scanned into batches of 500 - 1000 cards per PDF file. The tables of files are organized alphabetically by starting and ending subject. These index cards appear to cover from the beginning of The Detroit News into the late 1990s. The Archives of Michigan does not have microfilm of The Detroit Newspaper at this time. Because the cards are organized by subject, be prepared to look for different but related subjects if the first subject you try doesn't yield a result. The Passenger and Crew List Indexes are now ready to examine. Check out the index of those who crossed into Michigan from Canada between February 1901 and December 1952. There are instructions to order a copy of those you are interested in when you click on the "Passenger and Crew List Indexes" button on the left. Join us for a fun night where we have the genealogical answers and you have to come up with the questions. This will be a great way to socialize with fellow members as well as expand your genealogical knowledge!